Paying your monthly boost mobile dues is as easy as 1-2-3! Through Re-Boost, you have three 3 painless ways of obtaining unlimited credits for your mobile phone. With Boost Mobile’s wide-ranging daily and monthly plan options, you can have a wireless service that matches both your mobile data usage and budget needs. Online payments can only be done by logging in to your own ‘My Account’. It’s your personal web-based access to your service. Just enter your wireless phone number and 4-Digit PIN number here and hit submit. 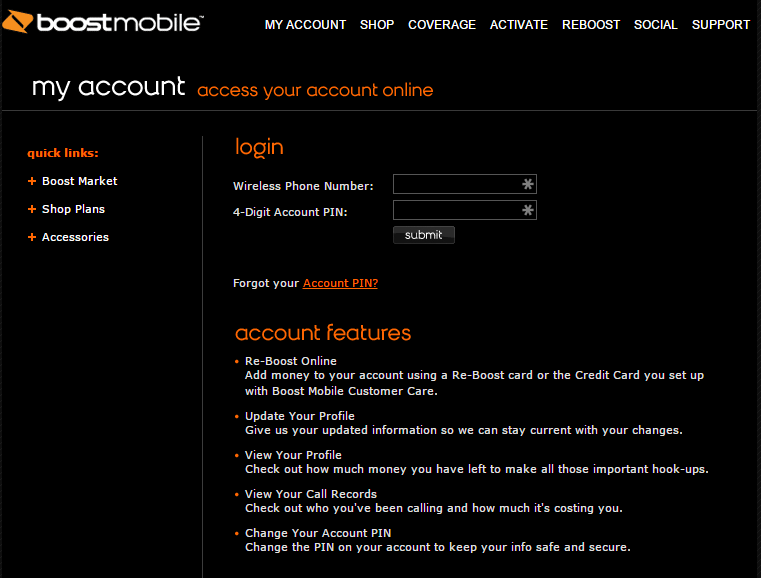 You will then be able to access and manage your Boost Mobile account anytime, even when on the go. Other features included are viewing and updating your profile information, access your call history and the amounts such calls cost you, and also modifying your account PIN for added security. Pay with your credit card or debit card – Once logged to your online account, you can use your credit or debit card information in making a one-time payment, setting it up for future bill deductions or hassle-free automatic payments of your monthly dues. PIN redemption – You can also earn credits by redeeming a 14-digit PIN from a receipt or a Re-Boost card you’ve purchased. Gifting credits ­- If you want to add some amount to a family member’s mobile or a friend’s it is also easy to do that without tying your credit card details to their Boost Mobile account. Just enter your recipient’s mobile number, your payment info, and your card information. There’s also a Facebook Re-Boost app that you may want to take advantage of when gifting prepaid credits to someone. If you want to pay the traditional way, that’s also not a problem. Simply go to the nearest Boost Mobile locations and stores to quickly pay your bill. You may check out this Store finder tool to find out the nearest center. Re-Boost prepaid cards can also be purchased via your local stores such as 7-Eleven, RadioShack, Target, and more. Boost answers consumers’ need for affordable yet quality mobile service coverage. With their flexible, broad network, you can always get in touch with people that matter to you without having to pay soaring charges. If you need help concerning your Boost service or for any further questions, you may either send an email through this link or simply dial these numbers: 1-866-402-7366. Call them Monday through Friday, from 4am to 8pm (PST). On weekends, they are available from 4am to 7pm (PST). © 2019 Quick Bill Pay. All rights reserved.